Welcome to the extensive range of Muhle shaving products at the Executive Shaving Company. 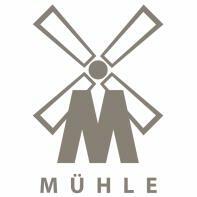 Founded back in 1945, in Germany, Muhle have risen to become one of the world’s leading manufacturers of top-quality razors and shaving brushes. Their R89 safety razor is one of the world’s most popular razors. The Muhle range now includes safety razors, straight razors, shaving brushes, shaving gift sets and accessories including shaving mugs, bowls and shaving stands. The have everything you need for that perfect shave. One of Muhle's greatest innovations is their Synthetic Fibre Silvertip shaving brushes. These brushes have all the benefits of a high quality, silvertip shaving brush but are made from 100% vegan fibres which are ideal for those with shaving skin problems and those who don't want a badger hair shaving brush. The synthetic fibre silvertip brushes are extremely hardwearing yet very soft and soft on the face. Simple, fuss free, typically Germanic styling is a feature of Muhle products, made in Germany, with quality assured.